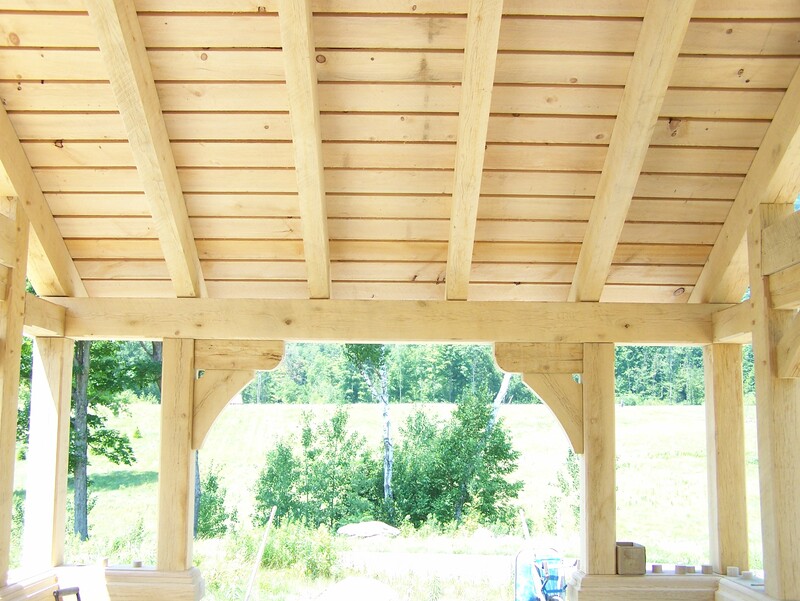 Last week, we finished putting the roof on the Timber Frame Gazebo. Despite the 95+ degree heat, to which we timber frame builders in Vermont are not accustomed, we sweated it through and completed the framing project in a few days. It really was fantastic heat for a couple of ole timers, so we started and ended early each day and headed to the pond or pool for an afternoon dip! We are satisfied with the results and I think even the Greene brothers would be pleased! In this picture, you can see how we laid the roof boards. Because cedar shakes need to breathe, we left 3/4 inch spaces between each of the boards. 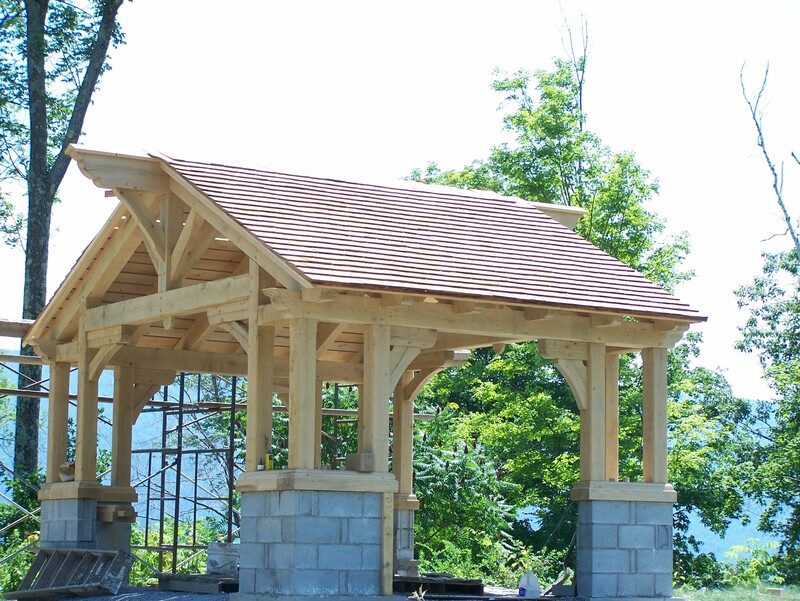 To complete the gazebo, a stone mason will be adding stone work around the edge of each masonry pillar anchoring the post and beam frame. 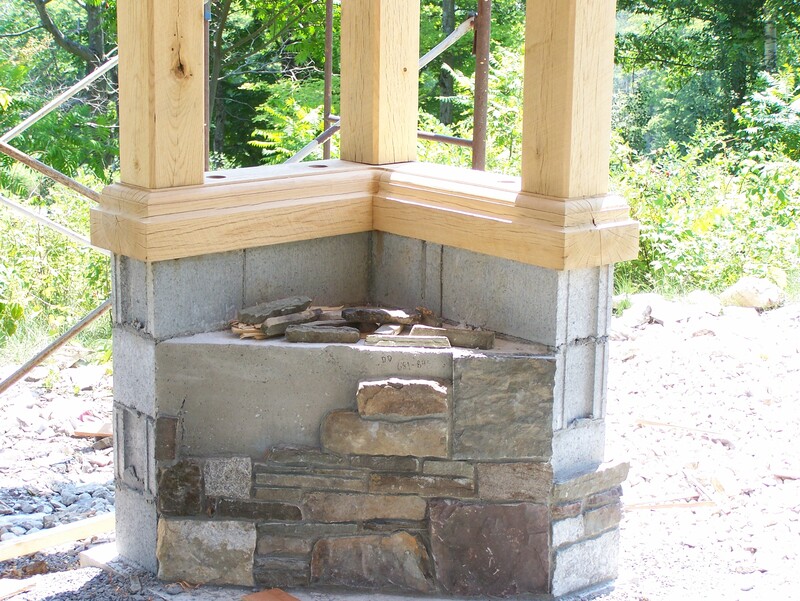 In the photo below, you can see a mock-up to offer a sense of how the stone pillars will look when finished. 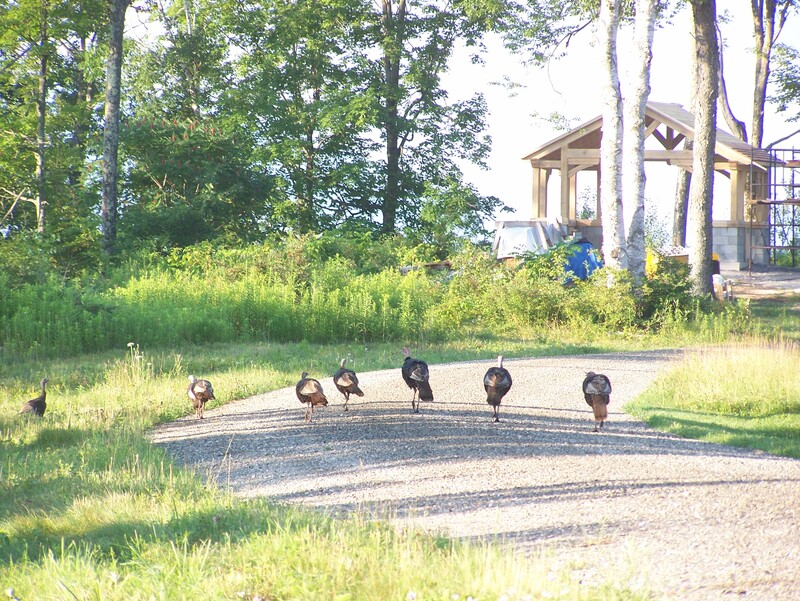 These turkeys seem to think it might be a fine place to roost! While this isn’t a timber frame for sale, we have plenty of available frames in stock at Green Mountain Timber Frames. And we are always having fun with new and exciting projects – from reclaimed timber frames and custom barn homes to timber frame restoration and green barn homes here in Vermont and throughout New England. We would love to hear from you – or show you around our shop during a visit to Middletown Springs, VT. This entry was posted in Green Mountain Timber Frames, Timber Frame Projects and tagged American heritage, barn restoration, colonial america, custom barn home, gazebo, historic New England, historic properties, historic timber frames, masonry, New England history, roofing, timber frame, vermont timberframe, vermont timberframes by Green Mountain Timber Frames. Bookmark the permalink. Cool! Love seeing your work even tho’ we don’t see you.